W pierwszym roku produkcji powojennej powstało 19.713 samochodów. Model 14.6 ma przedłużone nadwozie i sześciocylindrowy silnik, modele 10 i12 . 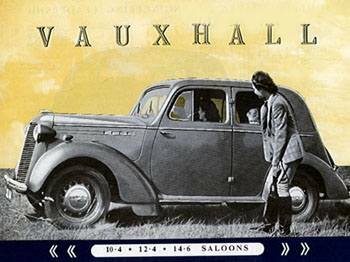 Vauxhall Motors' 1945/46 production programme comprised Ten (Series HIY), Twelve (Series I and HIX) and Fourteen (Series JIB) Saloons. Ten has 31 bhp 1203cc engine and 58 mph top speed. The Twelve was first produced (late 1945 to early 1946) with the 1940-style six-light body, but from March 1946 the same four-light body is used as for the Ten. The engine is a 1442-cc 35-bhp Four. Vauxhall Fourteen is a six-light saloon with 1781 -cc 47.5-bhp six-cylinder engine and a longer wheelbase than the Ten and Twelve (8 ft 9 in v. 8 ft 1 3/4 in). It is the same as in 1940, but no longer has the chrome radiator grille surround. All models has OHV engines and Dubonnet type IFS.